This is one of the albums of the year right here. 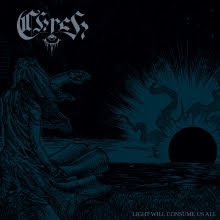 Starting off with an ominous and wonderfully eerie plucked intro and then descending into the madness that we all know and love, right off the bat it's clear that Light Will Consume Us All is going to be a memorable listen and an album that we can't easily forget. this is a record that grows on the listener, that ebbs and flows and continually hints at a breadth we can't underestimate. The sheer majesty of Chrch has only expanded since their stunning split with Fister, and this record is another gem in the crown. It's strange to me to hear this record crash out of the speakers. It's an album that is not only monolithic but also indicative of some of the greater poetry that this scene represents. Light Will Consume Us All is a masterpiece that seems to only grow with every passing moment. The sense of forward motion in the crushing bass tones and the potent songwriting only facilitates what Chrch has come to mean to so many. The crippling assault of tracks like Portals speak to the power of a band who have endless cult appeal. Yet despite the esoteric underpinnings of the band they remain steeped in Sabbath worship, only adding to the sense of sonic poetry. Bringing in quite a few more musical elements that create a much more rounded and in depth sound for the band, Chrch only seem to expand in their titanic beauty. The greater inclusion of male vocals in particular creates a nice counterbalance. These songs feel more fully realized and anthemic than anything the band has done before. It gives us something to sink our teeth into and stands as a fitting reminder that heavy metal can bring in so many weird and beautiful things. After all, the light will consume us all.